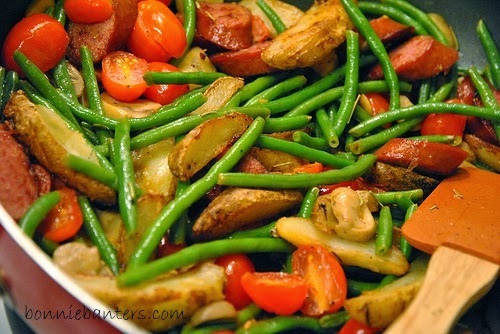 Bonnie Banters: Turkey Polska Kielbasa Sauté with Haricot Verts, i.e. Turkey Polish Sausage with Extra Fine Green Beans! If the potatoes are frozen, roast in your toaster oven about 1/4 of the suggested time, according to the package directions. Set aside. Heat the olive oil on medium-high in a large non-stick skillet. Sauté the sausage slices until brown on all sides, then remove to a holding plate. Transfer the potatoes to the skillet and sprinkle with a little salt and pepper. Brown on all sides, then remove to the plate with the sausage slices. Put the green beans into the skillet and sprinkle with the garlic and rosemary. Stir and heat for about 2 minutes. Add the mushrooms to the green beans and sprinkle with a little salt and pepper. Sauté about 2 more minutes. Add the tomatoes to the other ingredients in the skillet and sprinkle with a little more salt and pepper. Sauté about 1 more minute. Return the sausage and potatoes to the skillet. Stir and heat just until hot, about 2 minutes. Serve immediately. Leftovers can be stored in the refrigerator and reheated just until hot (ideally in a non-stick skillet sprayed with a non-stick spray). You really don't need anything else with this fantastic meal, unless you want to serve it with a crusty bread. Enjoy this dish and the time to spare! Maybe We'll Pop Some Corn & Watch A Movie! This is one of my favorite kinds of meals--simple and good. Kenny loves his Polish Kielbasa and I know as soon as he sees this, he's gonna be hounding me to make some..............Looks so tasty! 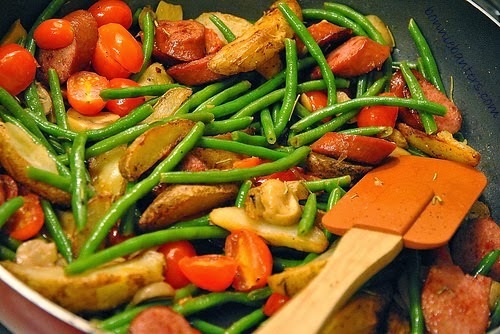 What a tasty, colorful one pot meal! It would be wonderful on this cold night!